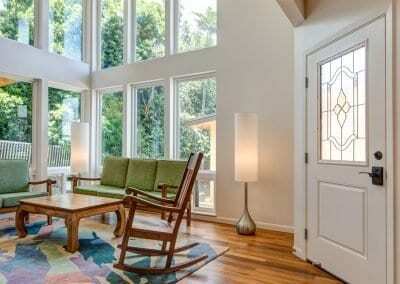 The homeowners of this property decided that it was time to rebuild their 60-year old home. 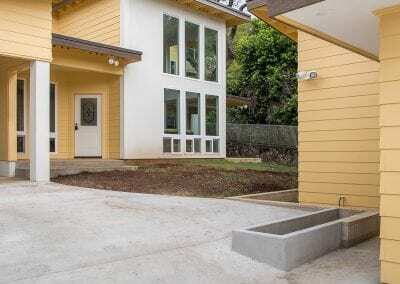 It did not fit the couple’s vision of a residence where they could live out their years nor did it allow one of their children to live nearby as they aged. 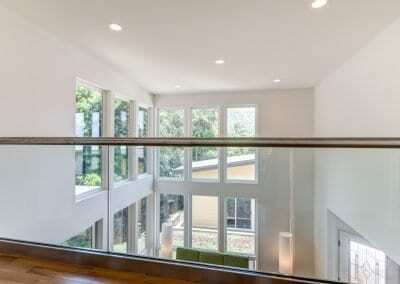 Still in the prime of their lives, the couple wanted an executive home to work in and enjoy with friends and family. 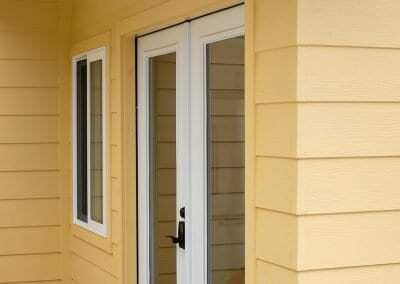 They also wanted an option to allow them to live safely in their later years. 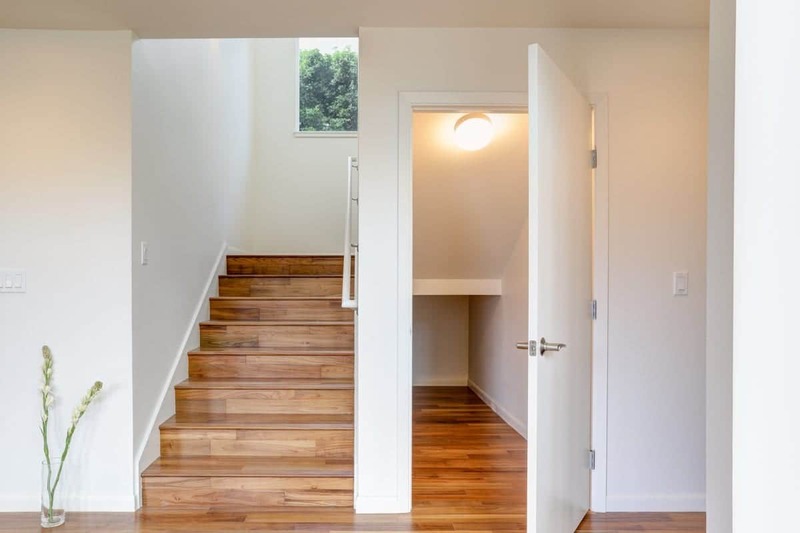 They believed that having an accessible ADU in addition to the main residence would allow a back-up plan when mobility makes climbing the stairs in our executive home difficult. 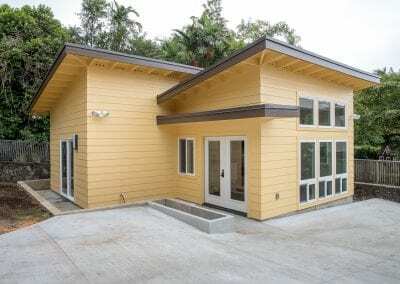 In addition, the ADU could provide their young adult son a place to live in while the couple is still active. Choosing to do a home construction project is a big decision. 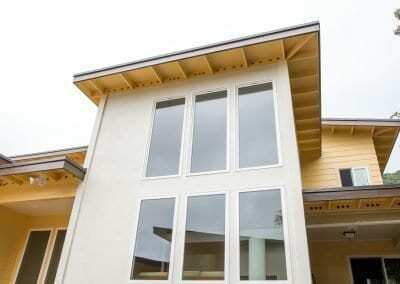 Large or small, residential projects are an investment of time and money. 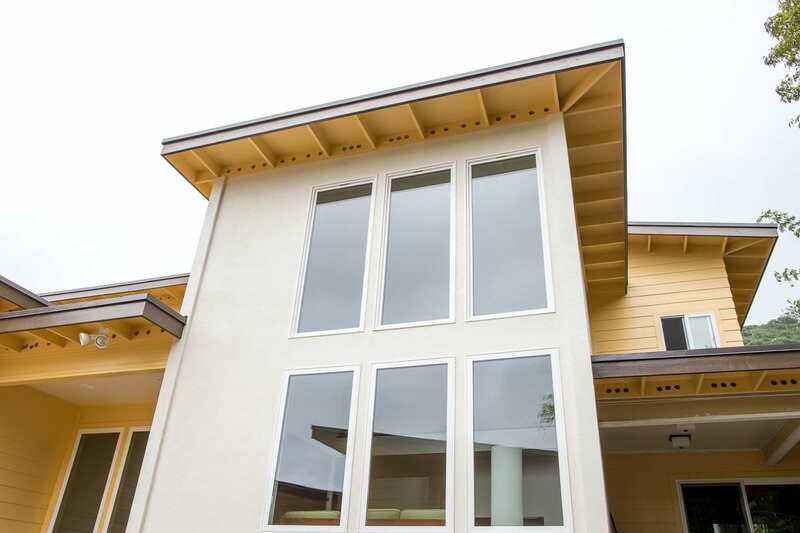 Selecting the right builder brings visions to life and gives homeowners a positive experience. 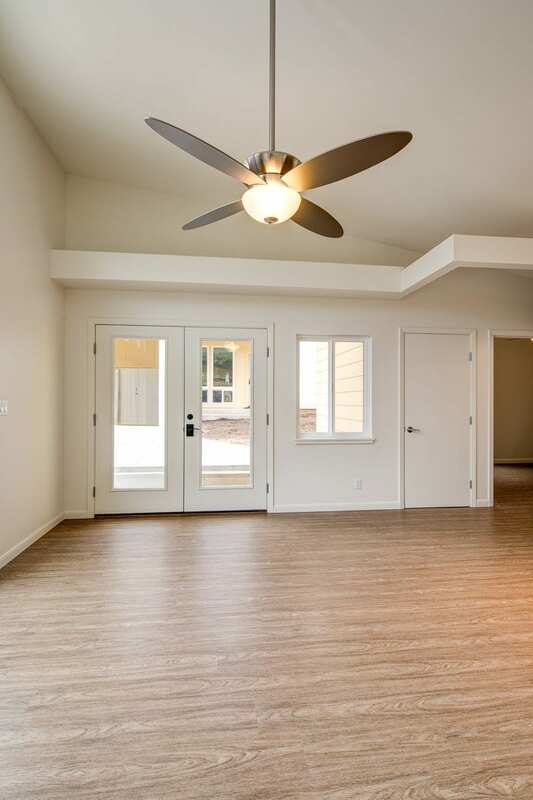 “We cannot say enough about the Graham Builders’ design team. 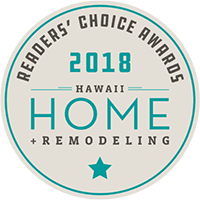 The step-by-step process that occurred over several meetings took us through the many construction details in a relaxed environment,” said the homeowner. 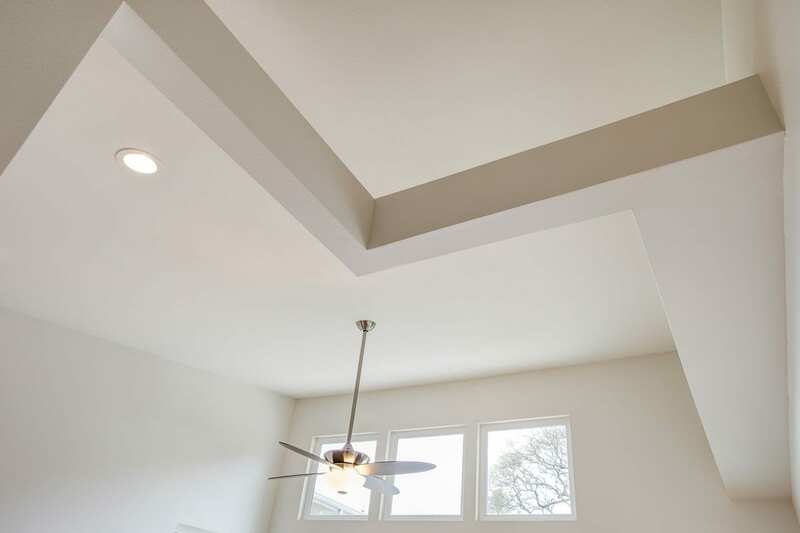 “They helped us value engineer our project and make selections that met our goals while remaining reasonably in our budget. 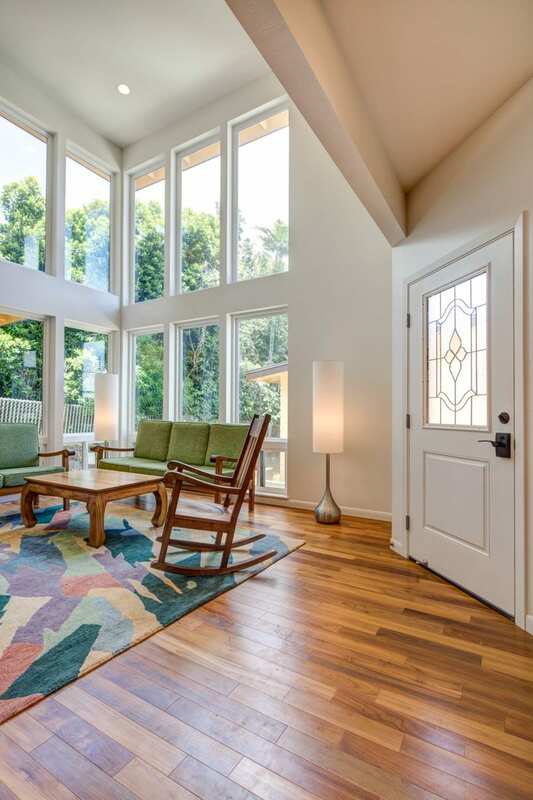 Tall windows are the centerpiece of this stunning residence. 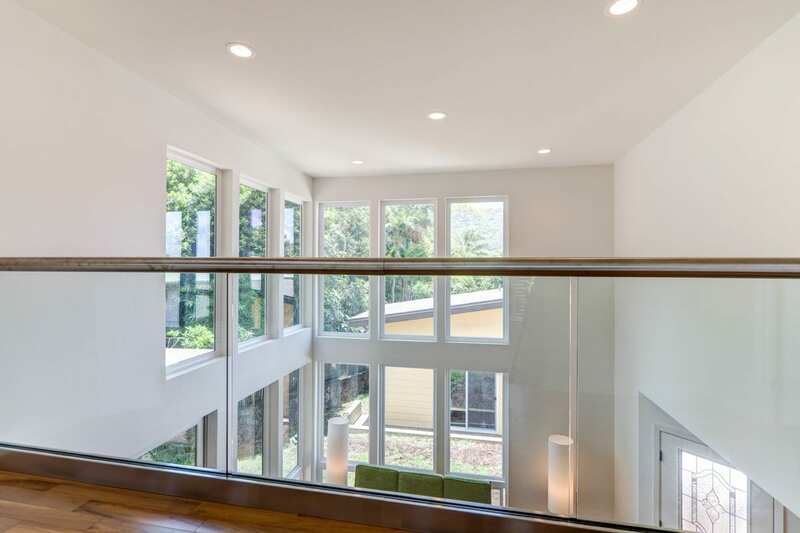 The tall windows allow light to flood the interior living spaces. 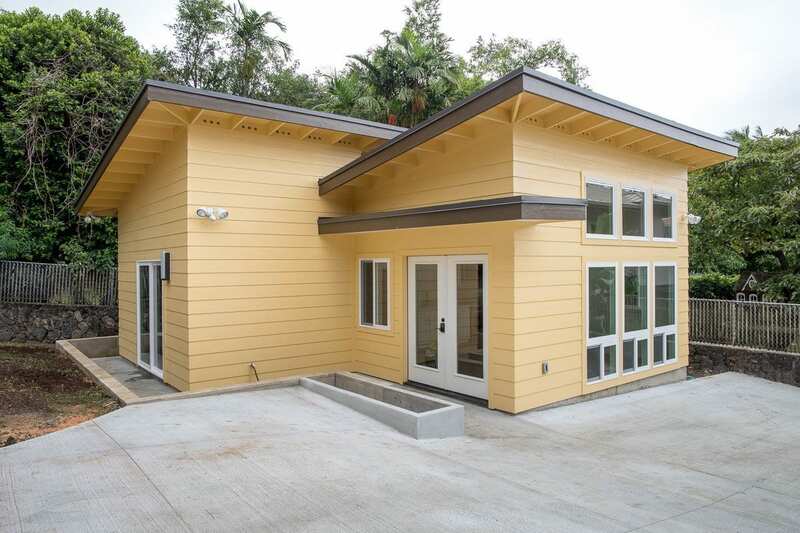 The homeowners enjoy their morning coffee while taking in the lush views of the Manoa valley. 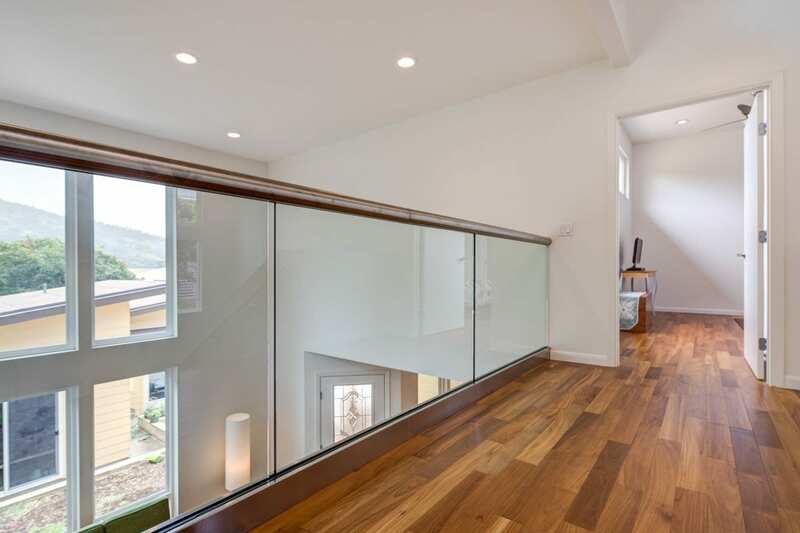 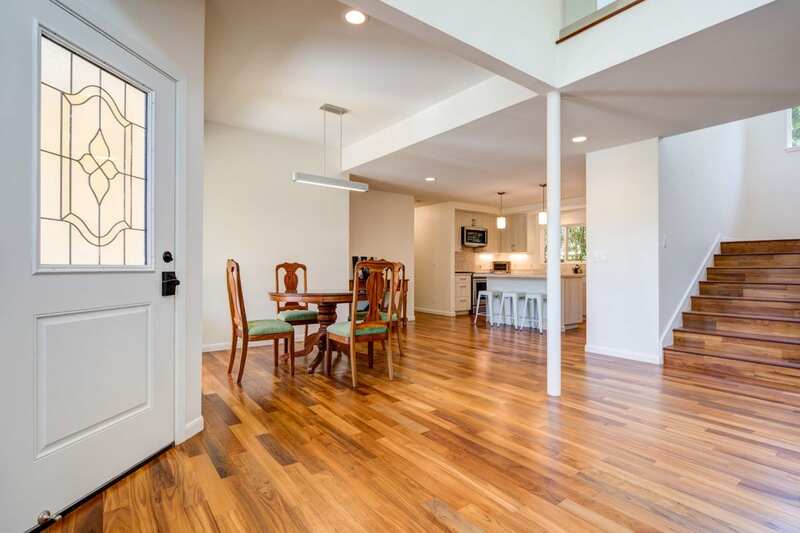 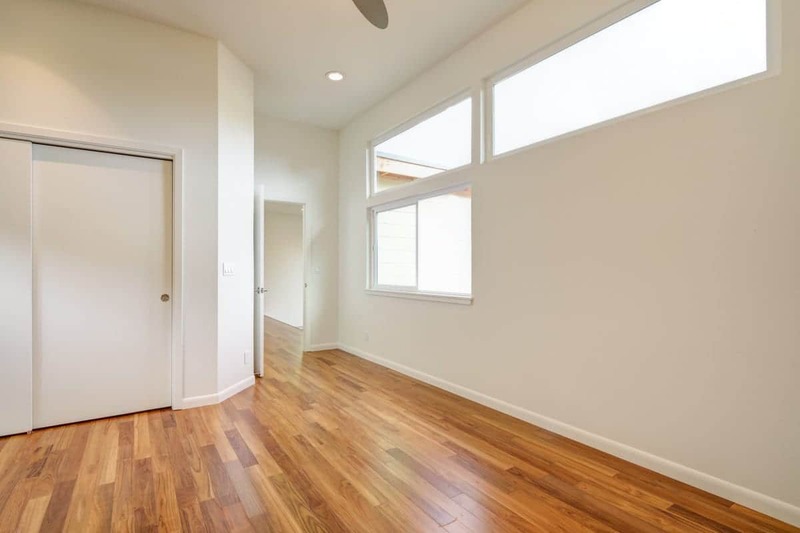 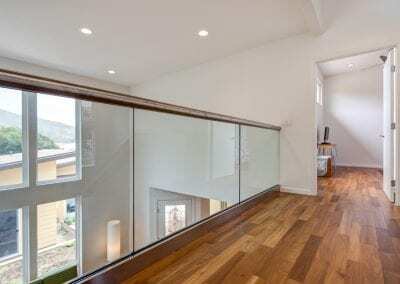 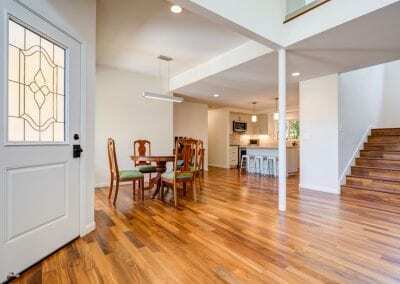 Acacia hardwood floors warm the overall feel of this contemporary home. 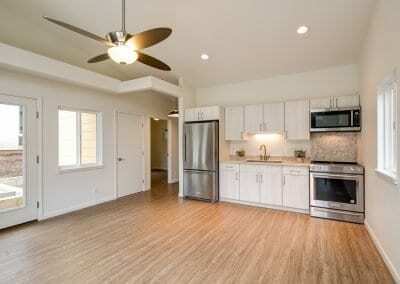 This kitchen was designed for cooking and easy flow for the cook, helpers and tasters. 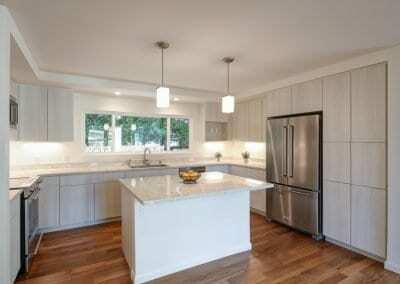 Quartz counter and island tops add to the luxurious feel. 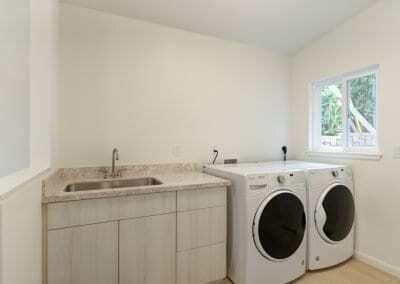 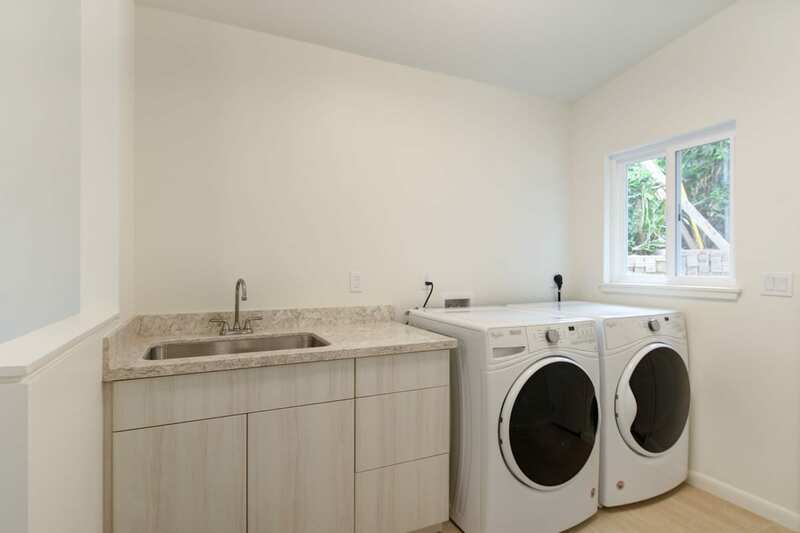 A generous laundry room doubles as a mud room and is located just off the garage. 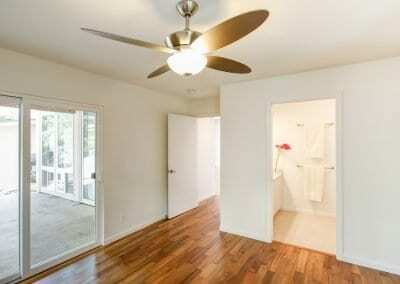 An accessible guest suite is located on the ground floor. 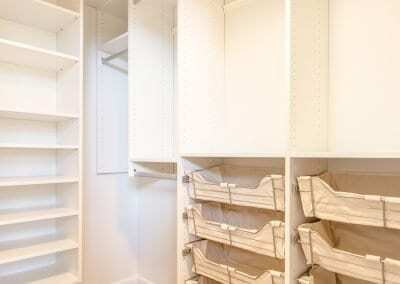 Ample storage is provided for the homeowners and their guests. 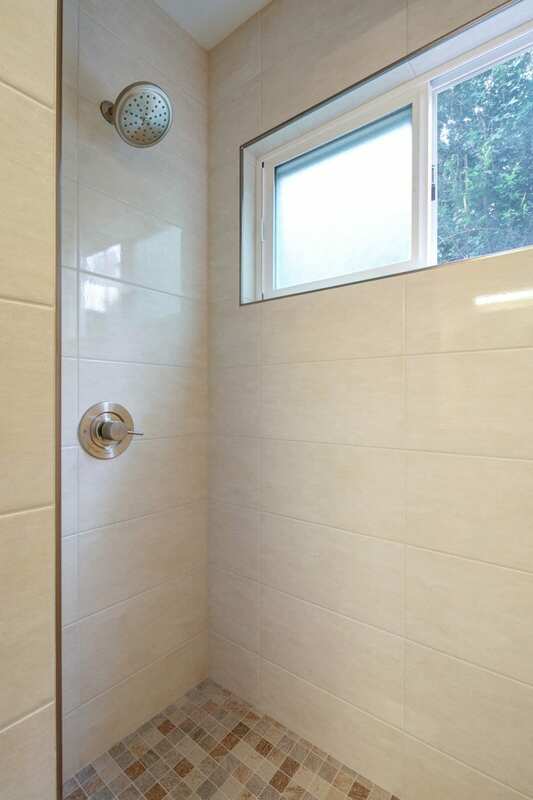 A zero-step shower is included in the guest suite. 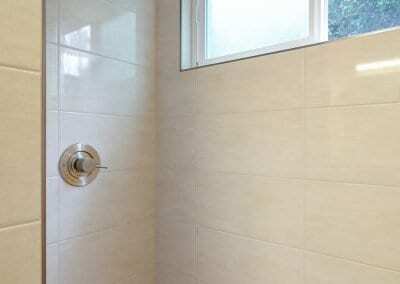 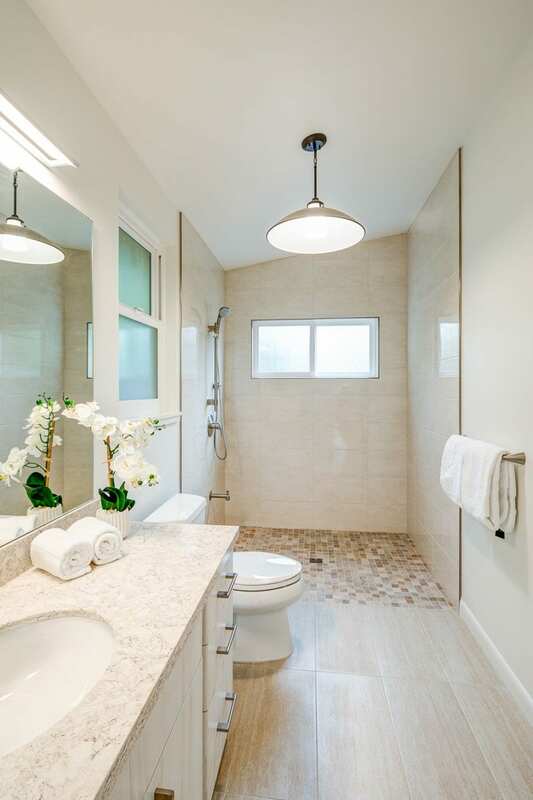 Porcelain tile is incorporated in the shower surround and floors. 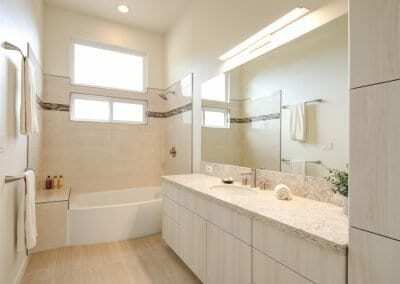 His and her sinks are set wide to allow both users ample elbow room. Under-stairs storage is ideal for suitcases and other large items. 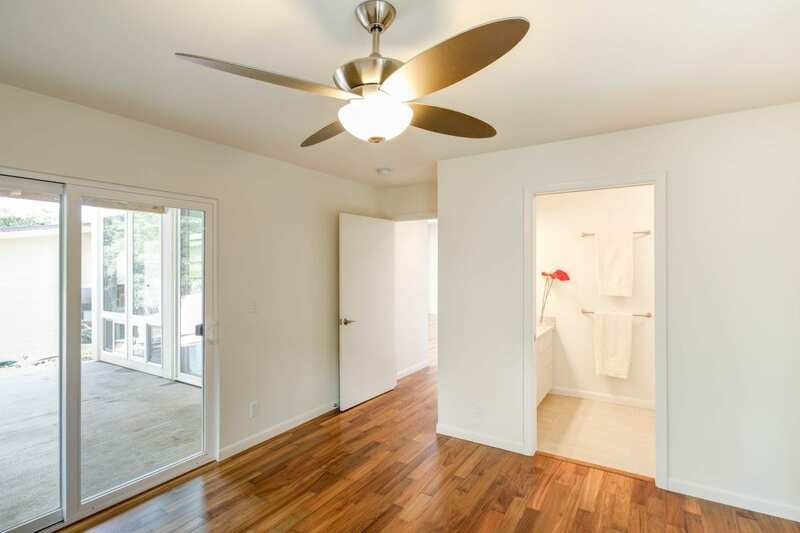 The entire landing connects the master suite to the den/office. 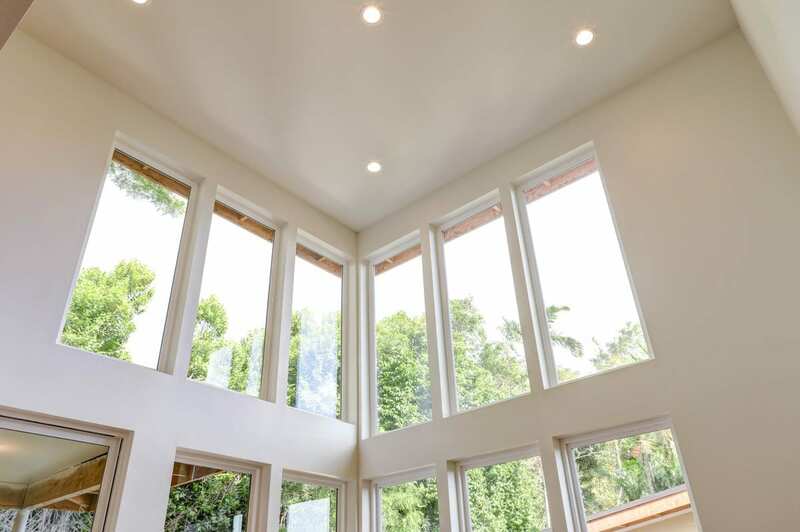 Clerestory windows, the windows above eye level, allow additional light and views into the master bedroom. 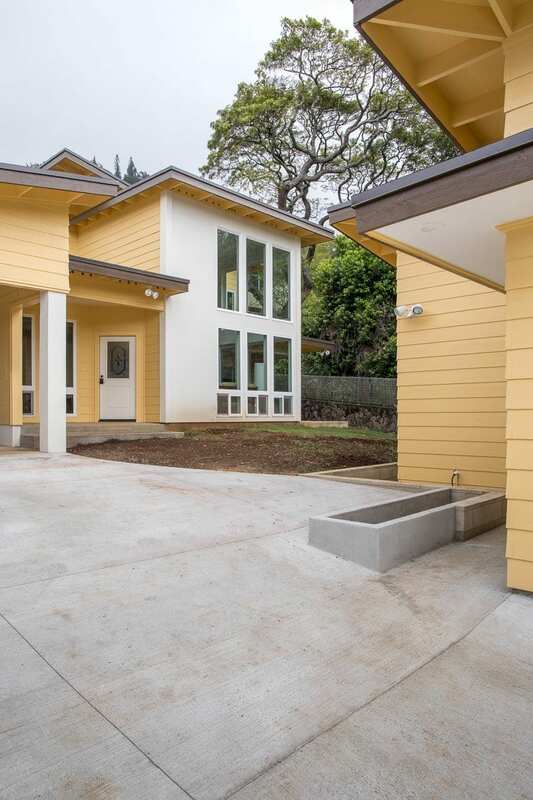 This contemporary accessory dwelling unit (ADU) was designed to complement the executive residence next door. 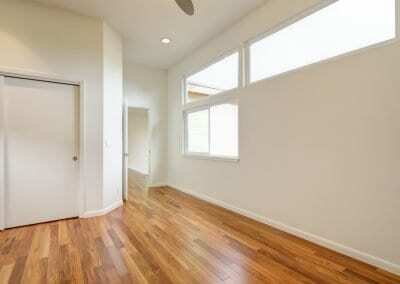 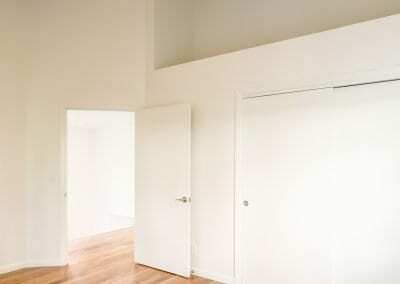 With only 545 square feet of living space, this 1-bedroom feels and lives large. 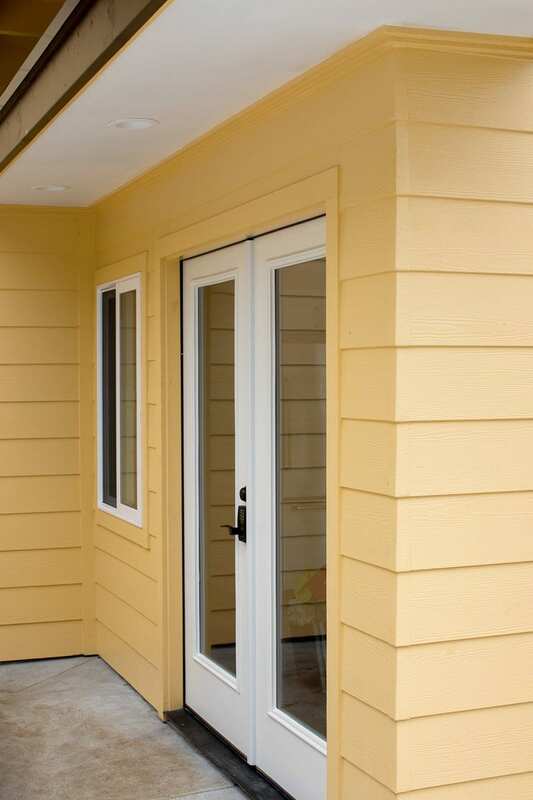 These wide doors allow easy passage into the home. 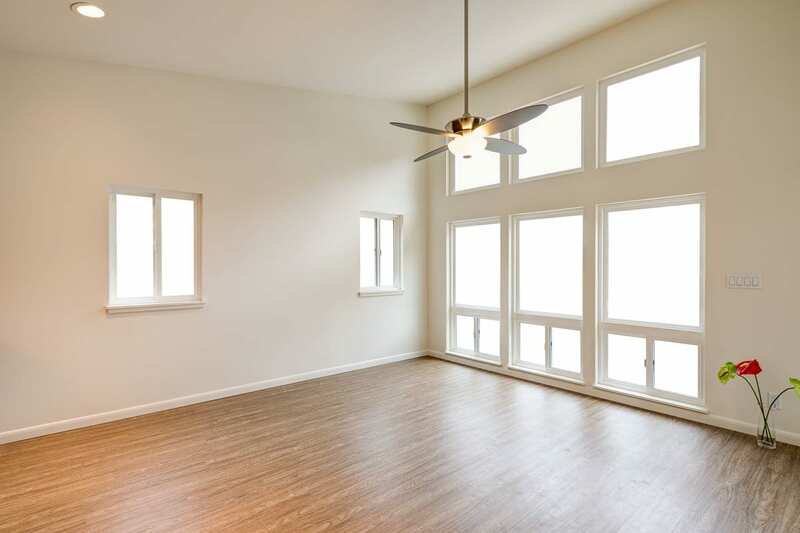 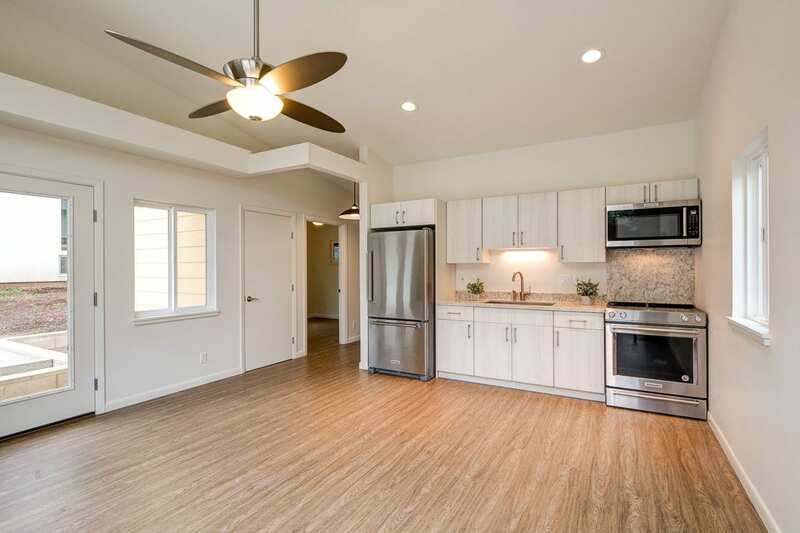 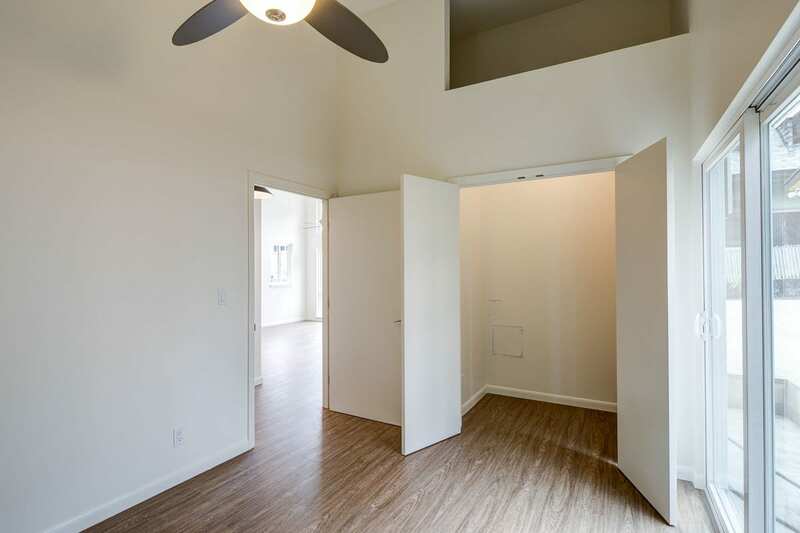 The vaulted ceilings add to the spacious feel of the unit. The vaulted ceiling is enhanced with this interesting architectural feature. 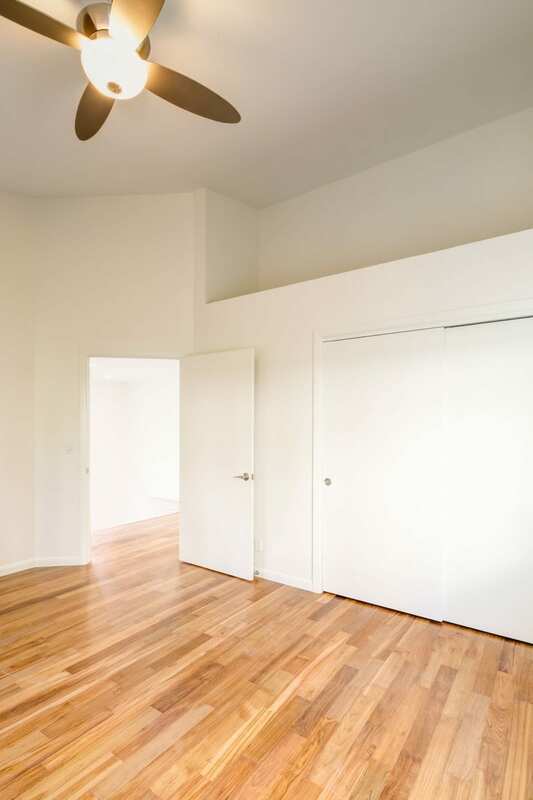 The open-design of the living area allows flexibility of use for the residents. 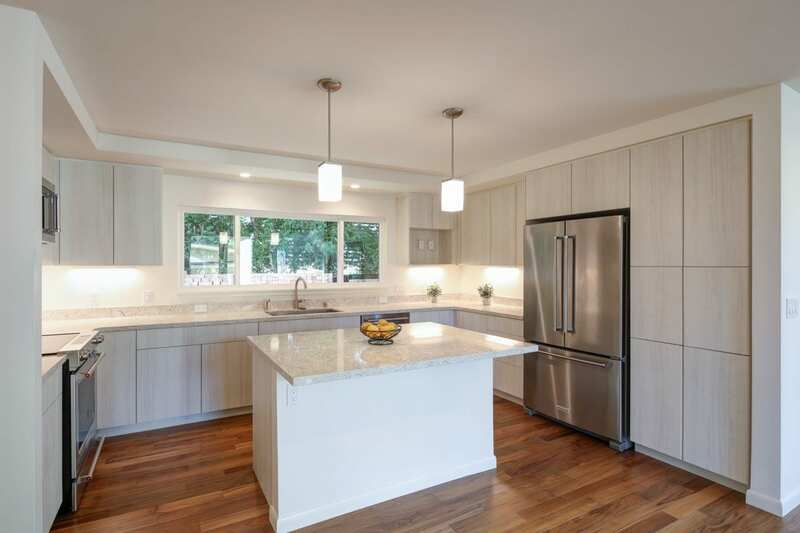 A full kitchen, an essential component of all ADUs. 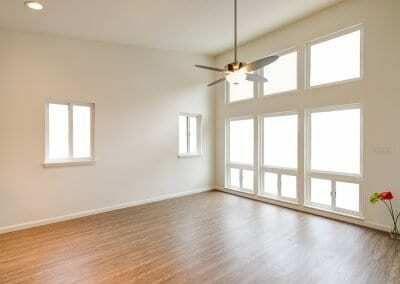 is included in the living area. 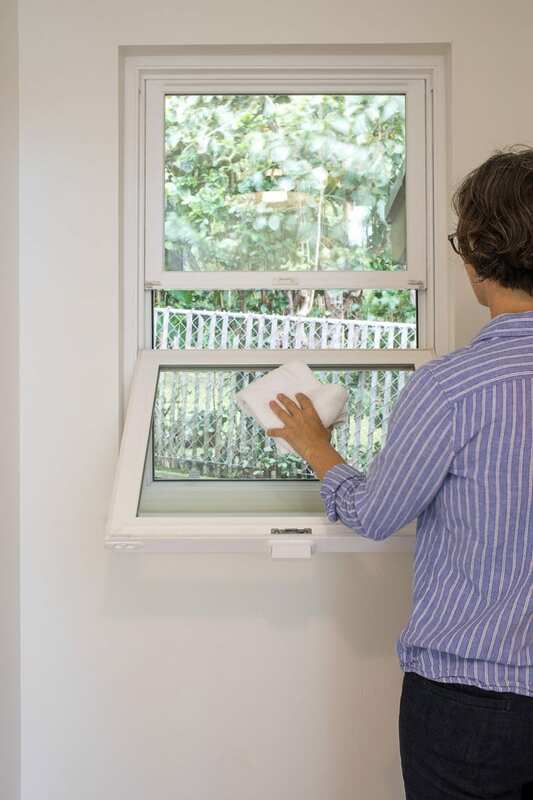 These tilt-out double-hung windows are easy to clean. 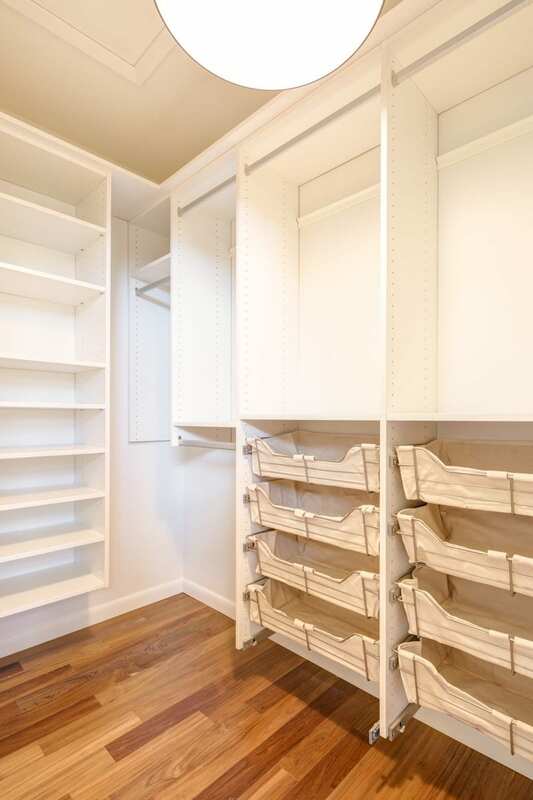 A large closet with overhead storage allows residents to keep items tidy and off the floor. 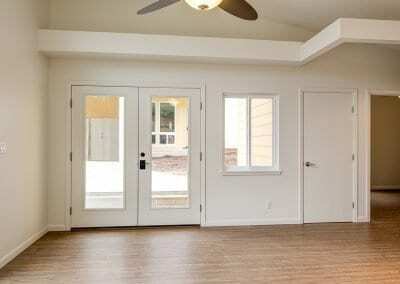 The sliding glass doors brings the outdoors into the room and also serves as an emergency exit if needed. A zero-step shower and accessible bath make this ADU perfect for aging-in-place.